Back when we celebrated my older son’s birthday, I made a giant salad to go with his requested timpano. Instead of serving the greens and passing the Ranch as I normally do, I decided to dress the salad ahead of time. 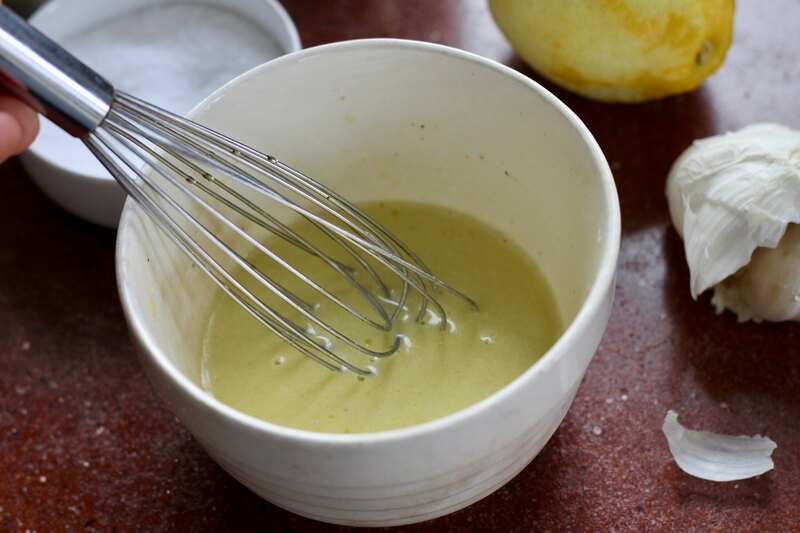 I’d read about a dressing recipe — more a formula than a recipe, really — on Cup of Jo and wanted to give it a go. This was risky. I’d bought one of those huge boxes of mixed salad greens from Costco, and dressing the leaves ahead of time would mean that any leftovers would need to be thrown out. Would we be able to eat the whole thing? What if no one liked the dressing? In the end, I decided to go for it. And it’s a good thing I did, too! The entire salad got gobbled. My mother couldn’t stop raving about it. Since then, I’ve made the salad — and its dressing — numerous times. It’s a hit with some people. Others, preferring their beloved Ranch, just tolerate it. But even that — tolerance — I consider a win. The basic “recipe” called for 1 to 2 cloves garlic, but I prefer a more moderate amount. Do what you want. Also, I recently splurged on a bottle of good quality olive oil and the flavor was different from the regular (still good quality) stuff I buy in bulk. I’m pretty sure it’s the fancy oil — peppery and rich — that make the whole thing so delicious. ALSO also, the recipe calls for champagne vinegar, but since I can’t find that in my regular grocery haunts, I just used regular white wine vinegar. Whisk well, or put in a pint jar and shake the hell out of it. 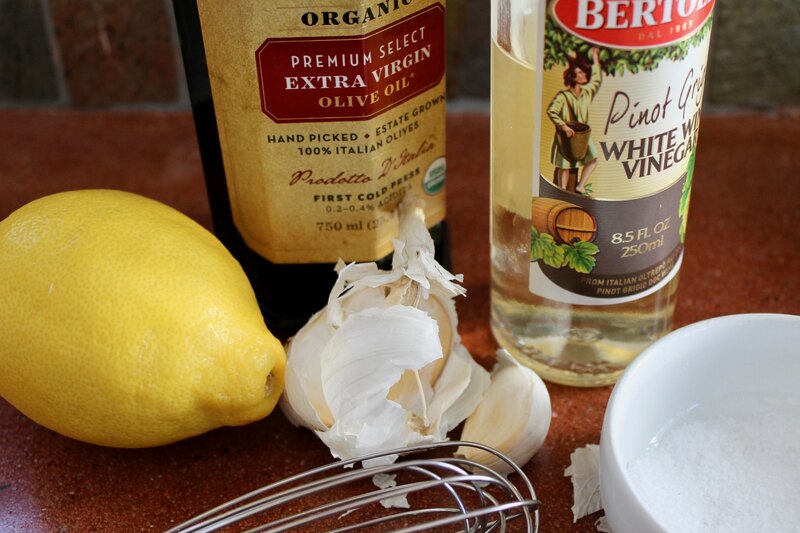 Taste and correct seasonings by adding more lemon (or vinegar) and salt, as needed. 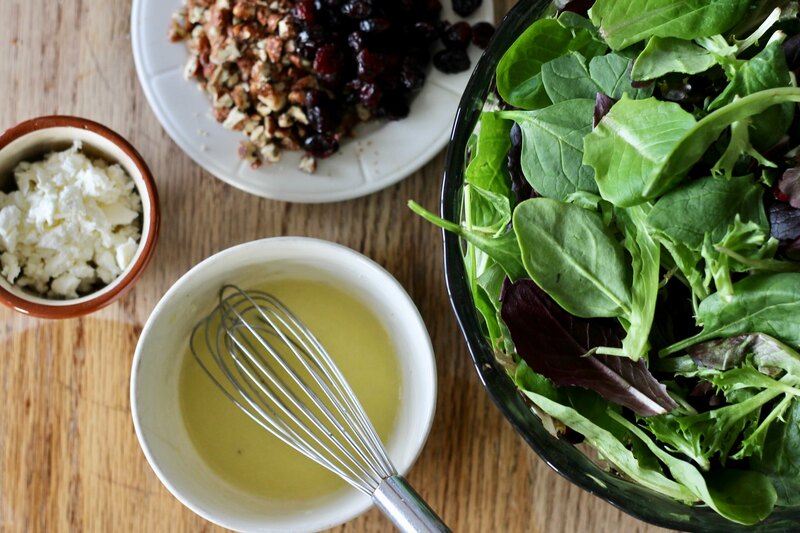 Leafy Green Salad: Heap a bowl with mixed salad greens, picked over. Right before serving, toss the leaves with dressing and sprinkle with a generous handfuls of craisins, feta, and candied nuts. Candied Nuts: Melt 1-2 tablespoons of butter in a cast-iron skillet Add ½ cup pecans, or walnuts, and several tablespoons of sugar. Toast, stirring frequently, until the sugar is caramelized and the nuts are a couple shades darker. Transfer the nuts to a plate to cool and sprinkle with plenty of flaky salt. Before adding the nuts to the salad, rough-chop. This same time, years previous: homemade grainy mustard, the quotidian (1.18.16), just do it, the good and the bad, vanilla cream cheese braids, quick fruit cobbler, peanut noodles. We love the French Lettuce Salad recipe from More with Less and it is very similar. Outlet stores often have good vinegars. Ollies, Big Lots, even the food isle in the back of Ross clothing stores are places that I have picked up some really good vinegar for cheap. Thanks for the recipe! So simple and so good. My new favorite!